Hands down, the most important thing to remember when you are getting married is to say, “I do.” If you can remember that line, then you are good for the day. It also celebrates the fact that you did and there’s nothing more exciting than that, right? 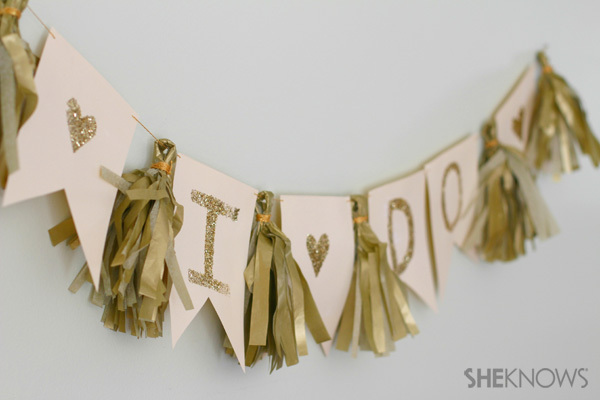 Today we’re making an elegant gold tassel “I do” banner using a few simple materials. 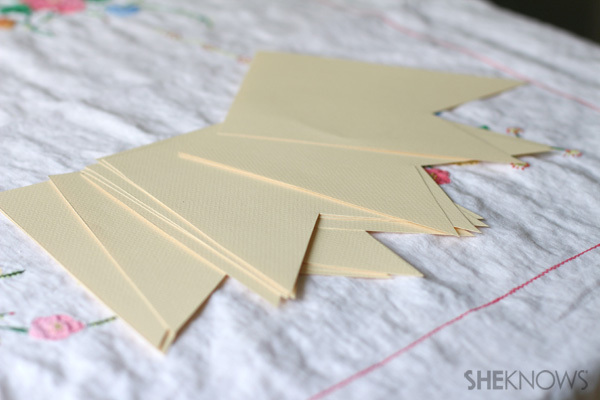 1 sheet of cream colored art paper (slightly textured). This can be found in the art supply section of just about any craft store. 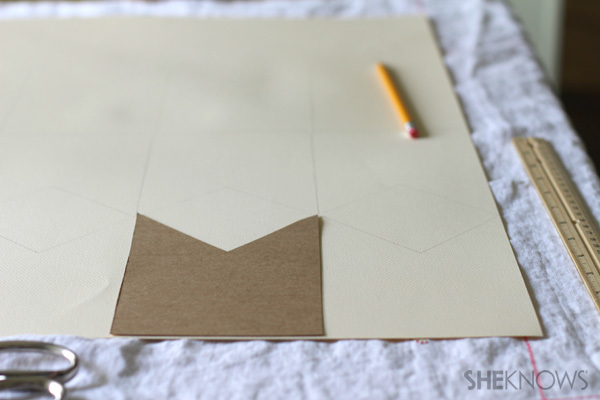 Cut a rectangle approximately five inches by seven inches out of your thin cardboard. Then cut a “v” shape out of one of the short ends to form a “swallow tail”-shaped flag template. Trace this template onto your art paper with a pencil and repeat to create as many flags as you wish. I made six flags — three for my “I DO” letters and three for heart shapes. 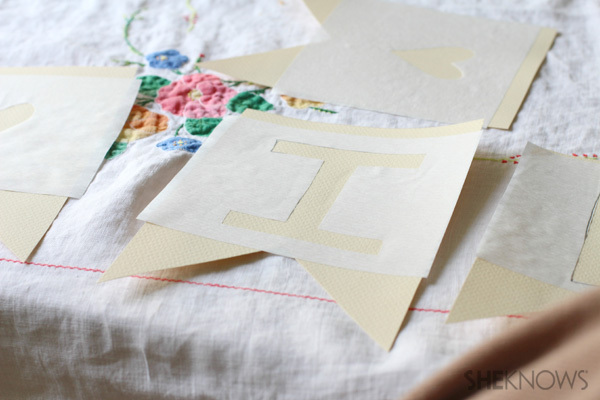 Cut small squares the size of the top portion of your flag out of freezer paper and draw your letters “I”, “D” and “O”. 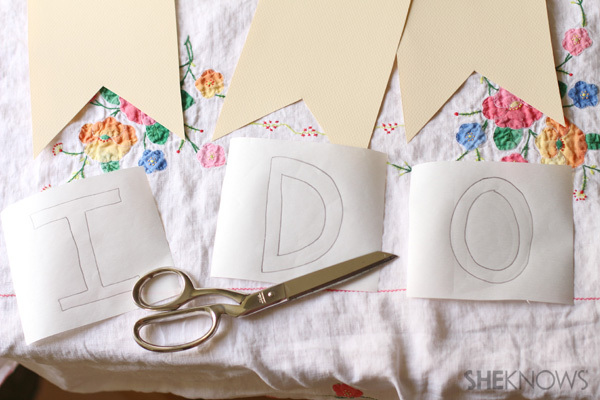 Cut out the inside of the letters being certain to leave the middle portion of the “D” and the “O” for your lettering template.” For your hearts, simply cut out a heart from the freezer paper by folding the paper in half, cutting the half-heart shape and then unfolding. With the wax side down and with your iron set to “dry” setting, iron on each lettering template to each flag. Do so quickly and just barely ironing the template on. If you iron on too firmly or iron too long, the wax will stick and not peel off well. 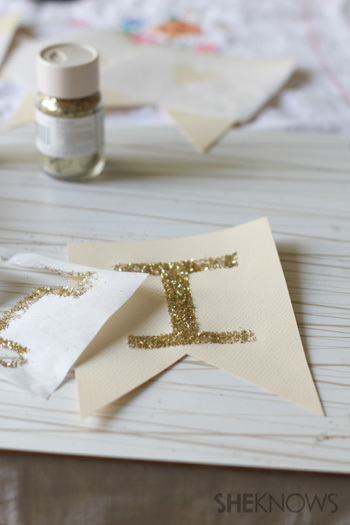 You just want to create a temporary barrier to glue and then glitter. As long as it’s just barely pressed on, it will do the trick. With a sponge brush, apply a very thin coat of glue. 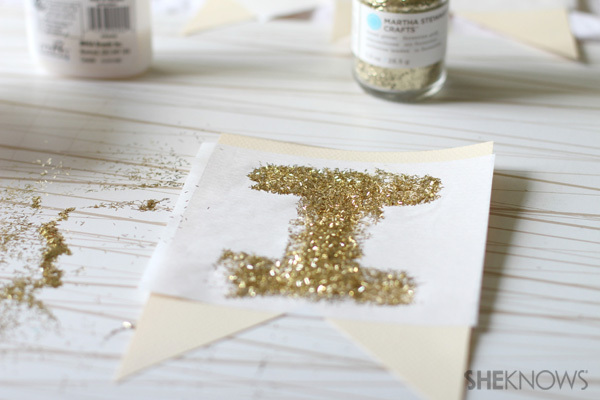 Sprinkle your glitter on top, shake off the excess glitter and immediately remove the template. Repeat until you’ve created all your letters and three hearts. 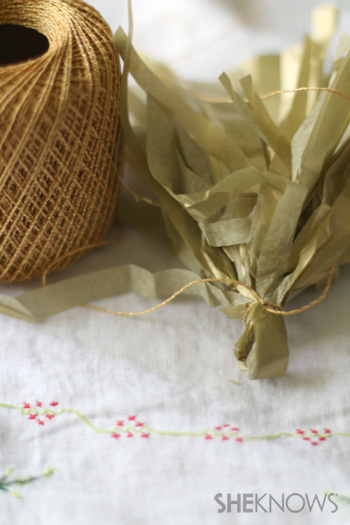 Gather supplies to make your tassels. 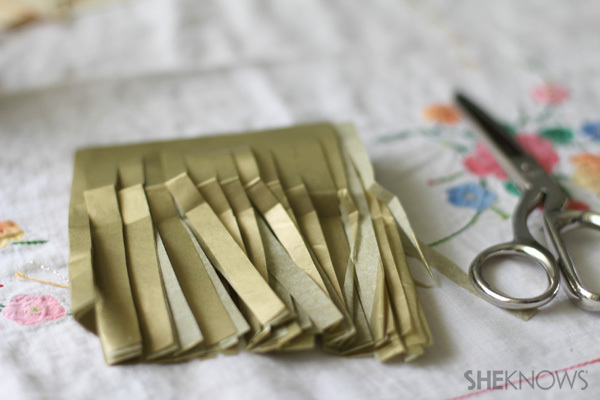 You will need gold tissue paper, the embroidery thread (or thin ribbon) and scissors. 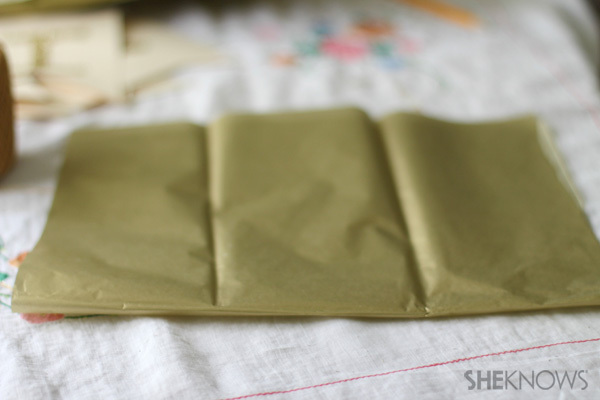 Fold a piece of gold tissue paper in half once and then once again. 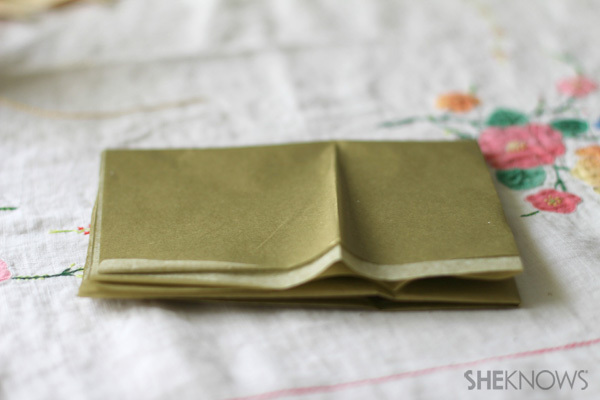 Finally fold your tissue in half one last time. 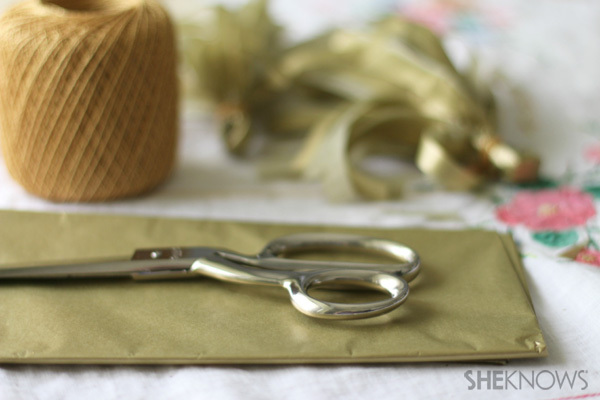 Using your scissors, cut some fringe along the bottom edge of each folded piece of tissue up toward the top fold stopping just before you get to the top. 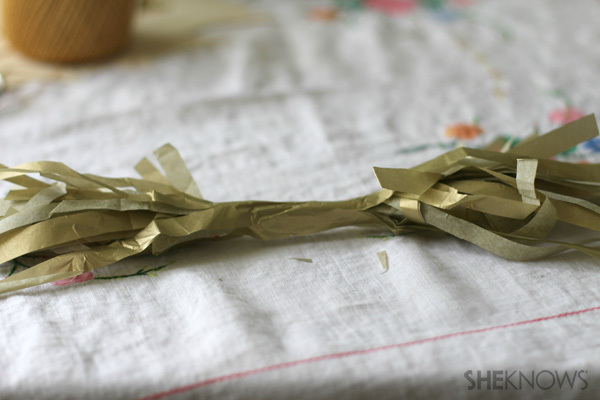 Begin rolling your fringed, unfolded tissue paper up into a roll. Do this with the fringes facing outward from either side of the center. Once you’ve created a roll, hold it together with your fingers and then fold over once, forming a loop at the top and fringes at the bottom. Tie the neck of the loop on the tassel with thread. 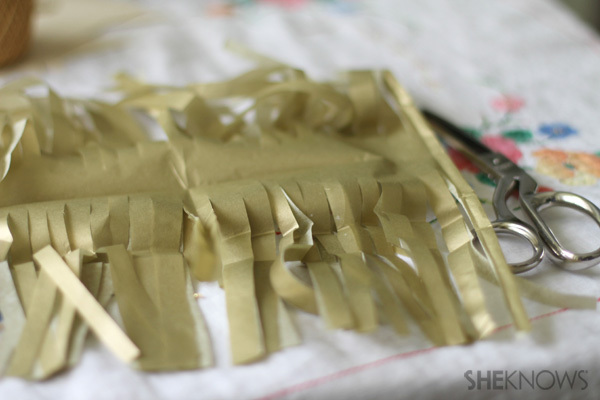 To make the fringe look finished, loop excess thread around the neck of the tassel and then tie off, trimming any excess. I created six tassels in total for this banner. 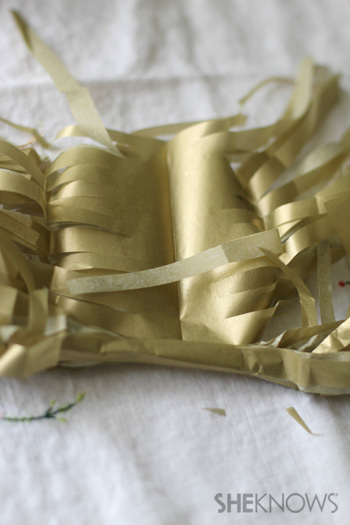 Lastly, lay all of your banner components out on the table and prepare to string them. I flanked each flag with a tassel with the exception of the “do” portion. I treated that word as if it were one flag and flanked it together with tassels. Tassel, Heart Flag, Tassel, “I” flag, Tassel, Heart Flag, Tassel, “D” and “O” flags, Tassel, Heart Flag, Tassel. There you have it! 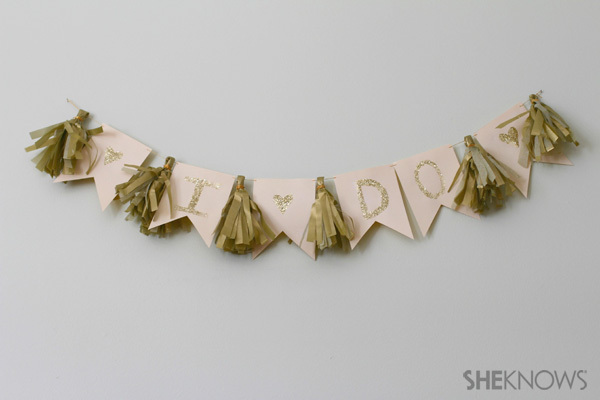 A gold tassel “I do” banner ready for your wedding celebration!